The goal of Fit Families is to safeguard the health of local, underserved children, who are at high risk for diabetes and conditions, many of which are associated with physical inactivity. With support from the Good Neighbors Campaign, students in the university’s doctor of physical therapy program lead the children, ages 10 to 17, and their parents in a variety of exercises every Saturday morning. They’re joined by a bilingual nutritionist who teaches the families how to eat healthy on a budget. But for the last 12 weeks, she’s switched up her routine. “Now I get up, take a shower and get ready for the program,” Matura, 42, said. 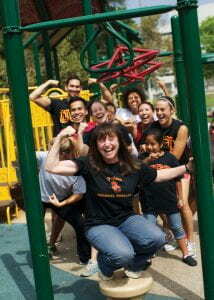 That program is Fit Families, now in its 11th year. 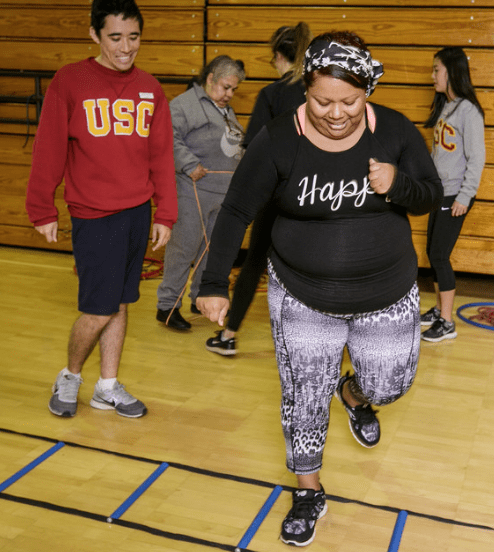 Put on by the USC Division of Biokinesiology and Physical Therapy, the free program takes place every Saturday and includes a three-hour guided workout followed by nutrition education. Energetically dribbling a basketball in the gymnasium at Bravo Medical Magnet High School, you’d never guess Matura was barely walking with the help of a cane a year ago. In 2016, she experienced two health scares — a stroke in February followed by a lupus diagnosis in July. A few months ago, while at her local YMCA, she was turned on to Fit Families by Oscar Gallardo, a USC physical therapy instructor. Since then, it’s changed her life — and her mom’s, too. On Jan. 28, they joined about a dozen other participants doing circuit training — cardio, stretches and strength training with resistance bands. 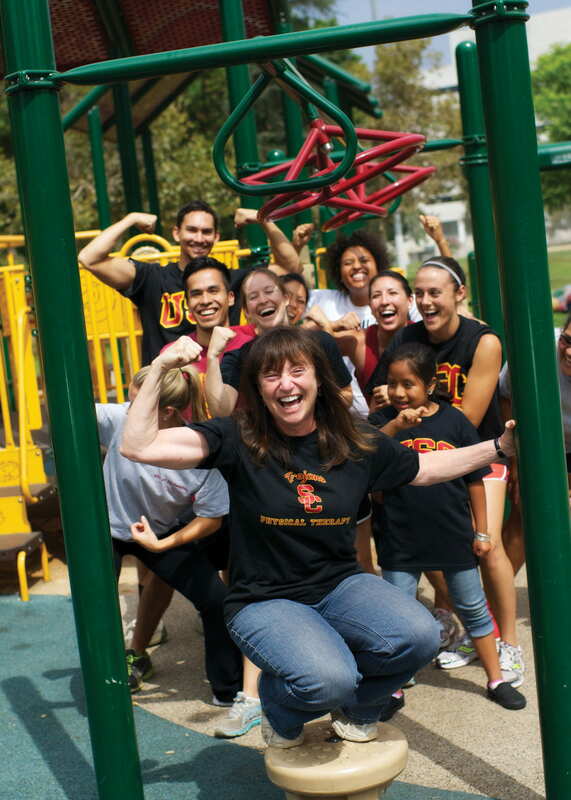 “Our goal is that by them learning to do it on Saturday, then the rest of the week they can go in their neighborhoods and work out together,” said Cheryl Resnik, the USC physical therapy professor who founded the program. Full story here.